Malaysia mountains may not be the tallest in the world; the country's highest mountain, Mt. Kinabalu, is less than half the height of Mt. Everest for example. Nor do Malaysia mountains have the classic snow-capped peaks that you see in other parts of the world, though it certainly feels cold enough for snow when you are shivering at the summit of Mt. Kinabalu! But the mountains of Malaysia do offer climbing challenges to suit all levels of ability, ranging from the strenuous exertion of a 9-day traverse of Gunung Tahan (for extreme hiking junkies) to a relatively gentle trek along the Klang Gates Quartz Ridge (more my cup of tea). A glance at the atlas will show you that there is a spine of uplands running down the centre of Peninsula Malaysia from the Thai border until it peters out just south of Kuala Lumpur. It is on this spine that the majority of the peninsula's highest mountains can be found although there are pockets of hilly areas elsewhere along the east and west coasts and in the Taman Negara area where western Malaysia's highest peak, Gunung Tahan is located. In Borneo, there is a range of mountains running roughly south-west to north-east dividing the Malaysian states of Sarawak and Sabah from the Indonesian province of Kalimantan. 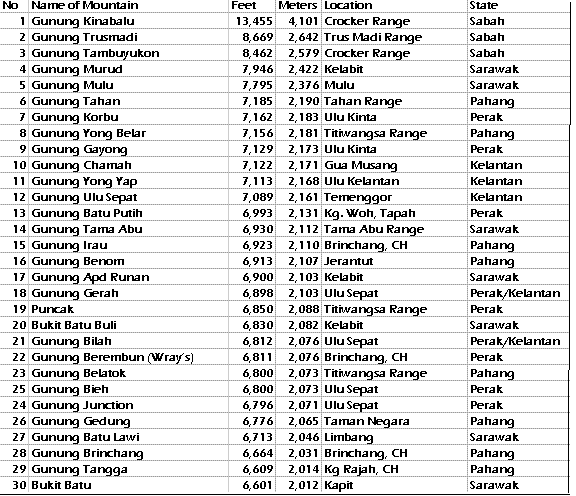 This range contains Malaysia's top 5 highest mountains. 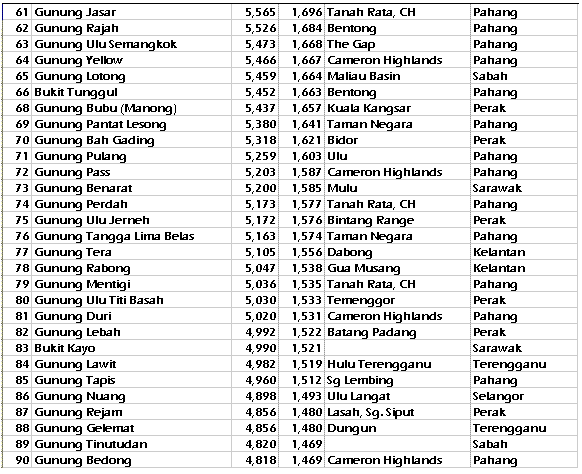 Below you will find a list of the 300 highest peaks in Malaysia - that should be more than enough to keep you busy for a lifetime or two! Some climbs follow well-marked trails while others are more overgrown with confusing forks in the path. Some are day-trips where you can get up and down in a few hours whereas others take days and you need to camp out in the jungle. Or, for those who are less energetic, there are one or two peaks that you can drive up (such as Gunung Brinchang), or take a cable car (Genting Highlands) or even a funicular railway (Penang Hill). What all the mountains have in common is that they are the best way to experience the pristine natural environment of Malaysia, to absorb some oxygen-rich rainforest air, see amazing trees and plants, get close to the insects (usually too close!) and perhaps sight some rare birds, reptiles and animals. Talking about insects, reptiles and animals, click here to read about leeches, spiders, snakes and tigers in my Malaysia Mountain Climbing Tips. 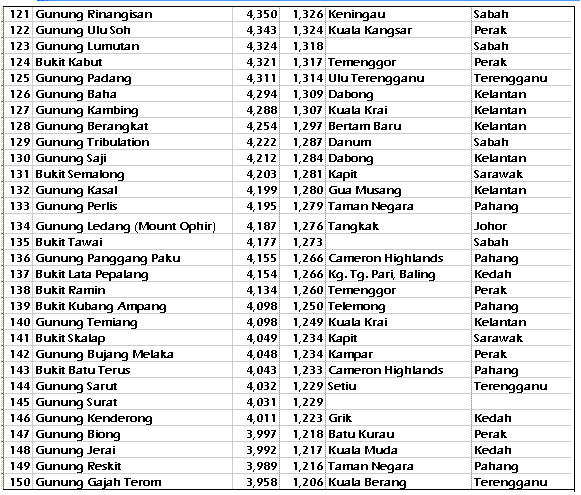 Read my account of Mount Kinabalu and see how it compares to other similar sized mountains in Asia, namely Mt. Rinjani in Indonesia and Mt. Fanxipan in Vietnam. If you are thinking of climbing Gunung Nuang (86th highest on the list) you can expect a long and exhausting day. See details, photos and videos of what to expect here. Pine Tree Hill Trail (number 94 on the list) is the longest and most demanding of the trails in Fraser's Hill. I have not yet climbed this peak but here is some information on what to expect. I decided to drive up Gunung Jerai (Kedah Peak) to save walking. Read about it here. To read about my trip to Gunung Telapak Buruk (Malaysia's 155th highest mountain) click here. You can read about my walk up Bukit Larut (Malaysia's 189th highest peak) here, though I only went as far as the waterfall. Climbing Gunung Datuk (#220 on the Malaysia Mountains list) is a strenuous half-day hike through thick jungle. At the 2900ft high summit you will be rewarded with excellent views and cooling breezes. Enjoy superb views of Langkawi from the tower on top of Gunung Raya, the island's highest peak and number 225 on the list. You can drive up or walk. Read full details here. 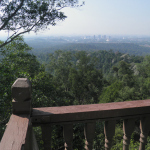 In December 2011, I took the family for a 2 1/2 hour hike up Penang Hill (#239 on the list). Not too strenuous and at the top we enjoyed great views, a tasty meal and we met a pet snake. Read about it here. Click here to read about my climb of baby Gunung Angsi ( Malaysia's 241st highest peak). 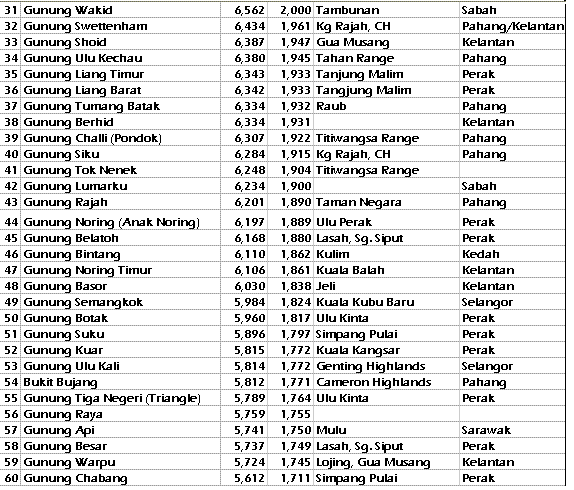 Gunung Kledang in Perak (number 245 on the list) is a popular hill to exercise for Ipoh-ites. See photos, map and details here. Even the 285th highest mountain is not that easy to climb. Read here about Gunung Lambak. This hill in Lumut is not quite tall enough to make the Top 300 list but still provides an energetic workout with great views over Pangkor Island. If the above Malaysia Mountains sound too difficult, try baby Bukit Sapu Tangan for a more leisurely hike, conveniently located in Taman Botani Negara Shah Alam. You can read details here on my Thrifty Traveller blog. 'Gunung' is the Bahasa Malaysia word for mountain and 'bukit' is Bahasa for hill. It does not always follow that a bukit is smaller and easier than a gunung. 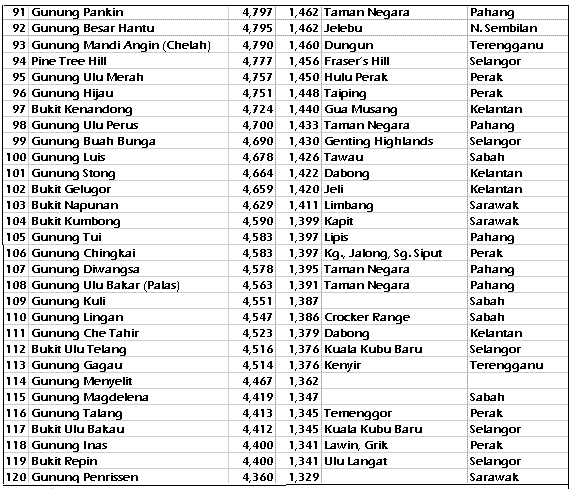 There are some very demanding bukits such as Bukit Batu Buli while some small and relatively easy peaks such as Angsi and Datuk are known as gunungs. I was somewhat deflated by Zaini's response. Having climbed Mount Kinabalu (via the Timpohon trail) and having pushed myself to the limits in the process, I naturally assumed it would be the most difficult so to have it rated as 'easy' is rather disappointing. Still Zaini knows what he is talking about so I definitely will not be trying to climb Korbu (very, very hard) in the near future.